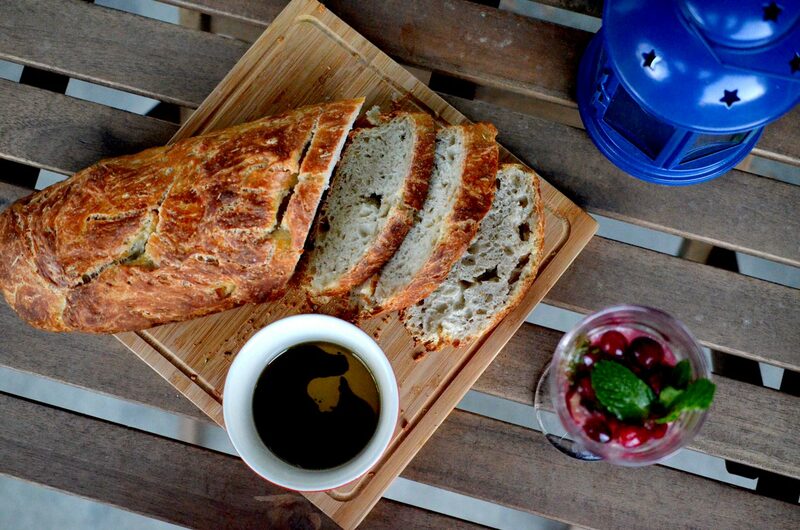 When my family gets together for large family gatherings, like Thanksgiving or Christmas, we like to start our meals with some delicious bread, olive oil and balsamic vinegar. It is an easy starter that sparks conversation and is perfect for large crowds. I always enjoy making the bread together, as it brings the family closer working on the project (and choosing the flavours) and then in enjoying the reward afterwards. This recipe is very simple and can be made with any age group (and a little patience!). Whisk flour, yeast and salt in a large bowl. Add water, beer and vinegar. Using a large fork or your hands, scrape up the dry flour until a shaggy bowl forms. Cover with plastic wrap or a tea towel and let rest in a warm place for 18-24 hours. Lay a large sheet of parchment paper in a dutch oven, covering all of the sides , and spray with non-stick spray. Transfer dough to a lightly floured work surface and knead dough 10-15 times. Shape dough into a ball by pulling the edges into the middle. Transfer the dough, seam-side down, to the parchment-lined dutch oven. Let any excess parchment hang over pot edge. Cover loosely with plastic wrap and let rise in a warm place until dough has doubled in size and does not readily spring back when poked, about 2 hours. Adjust oven rack to lowest position. Lightly flour the top of the dough and make a few shallow slits along the top using a sharp knife. Cover with lid and place in oven. Heat oven to 425F. Once oven has come to temperature, bake for 30 mins. Remove the pot lid and continue to bake until loaf is deep brown. Once the center of the bread reaches 210F, about 20-30 mins longer, carefully remove the bread from the pot and transfer to a wire rack to cool to room temperature.